Extrude is defined by Merriam-Webster as “to force, press, or push out.” Extrusion in the context of 3D printing is pushing heated filament through the nozzle—this is done by the extruder. 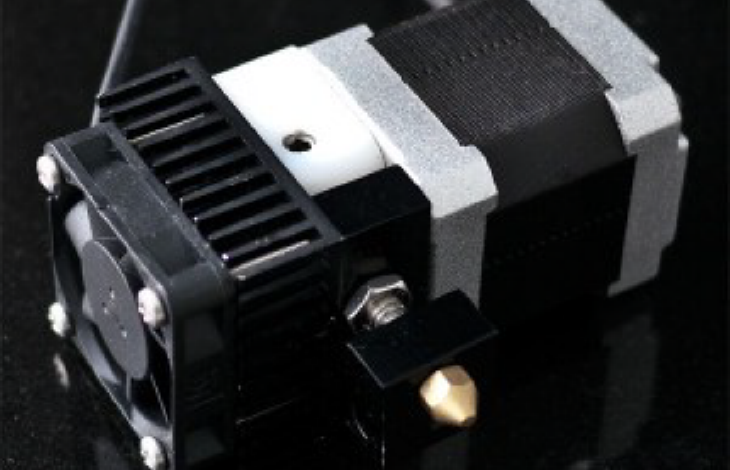 An Extruder is a component of a 3D printer made up of a stepper motor, heat sink, fan, hot end and nuts and bolts to hold the assembly together. Some printers have duel extruders. A printer with duel extruders can accommodate two different colors of filament. Another option is one extruder can extrude one kind of plastic (e.g. PLA) and the other extruder can extrude another kind of plastic (e.g. ABS). You could build a multi-colored piece or a piece that contains more than one type of plastic without changing the filament.